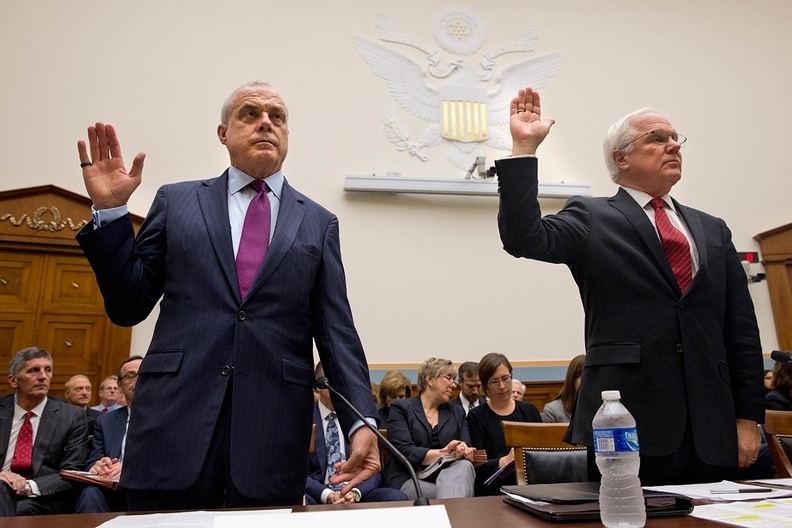 Aetna CEO Mark Bertolini (left) and Anthem CEO Joseph Swedish testify before Congress on their companies' pending megadeals. While regulators and consumers debate the merits of the large pending health insurance mergers, attorneys and financiers are seeing their incomes grow. Aetna, Anthem, Cigna Corp. and Humana cumulatively have spent more than $400 million on armies of lawyers, investment bankers and other advisers who have crafted and advocated for their respective mega-mergers. That money covers after-tax expenses from the time the deals were announced last summer through the end of this year's first quarter on March 31. It's been almost a year since the largest players in the health insurance industry publicly revealed their pursuits. Last July, Aetna agreed to buy Humana in a $37 billion deal to bolster its Medicare Advantage business. Weeks later, Anthem and Cigna finalized their own transaction, which is currently valued at $53 billion and would predominantly consolidate employer health-plan options. If Aetna and Anthem obtain approvals from the U.S. Department of Justice and state regulators, they will, along with UnitedHealth Group, create a powerful triumvirate of for-profit insurers. But deals of that size come with hefty transaction costs. “Bankers and attorneys charge a pretty penny,” said Jeffrey Loo, an equity analyst at S&P Capital IQ. Anthem has spent $139 million after taxes on legal fees, financial consulting and bridge-loan financing costs in its bid to complete the Cigna acquisition, according to an analysis of its financial records. Aetna has spent at least $119 million post-tax on its Humana transaction. An Aetna spokesman said a “majority” of the insurer's $233 million in total transaction-related expenses since last year has gone toward the Humana deal, but he did not provide a specific figure. Aetna's Humana-related expenses could conceivably exceed $200 million. Cigna and Humana paid lawyers and bankers $93 million and $52 million, respectively, on an after-tax basis for their transactions. Combined, the acquisition-related costs for the four insurers total $403 million since the deals were announced. The banks and corporate law firms that have been hired to caress the deals span a catalog of companies. Aetna's financial advisers have been Citi and Lazard, while it hired Davis Polk & Wardwell as its legal counsel. Goldman Sachs Group has acted as Humana's financial adviser (Brian Kane, Humana's chief financial officer, used to work at Goldman Sachs), and Fried, Frank, Harris, Shriver & Jacobson has served as its legal team. The transaction costs will continue to rise depending on when, or if, the mergers get the green light. Executives at Aetna and Anthem, which have defended their acquisitions before Congress, believe they will get final approval in the second half of this year. However, Cigna hedged on the timing of the Anthem deal last week, when the insurer said in a quarterly filing that “the complexity of the regulatory process” could push back an approval until 2017—after the presidential election. Each insurer has had to work with the Justice Department and several state insurance departments, many of which have held public hearings, and that runs up the billable hours for lawyers. “You talk about how many attorneys are involved—it's a good amount of work,” Loo said. Donna Hitscherich, a professor at the Columbia Business School in New York, and a former lawyer and investment banker, says financial advisers often work with a company for a long time—helping to prepare for shareholder approval, determining if certain assets should be divested, auditing financial reports—without getting immediate payment. “It tends to be the culmination of a longer-term relationship,” Hitscherich said. Aetna and Anthem are on the hook for large break-up fees if the federal government or state regulators nix their deals. Aetna would owe Humana $1 billion, and Anthem would have to pay Cigna $1.85 billion.